1. Influence – Leadership is all about the ability to influence a group toward a common goal. You may not have the ‘authority’ over the people you’re influencing, but you can have a huge impact if you assess the individual values/concerns and address them up front – before trying to do the ‘hard sell’ of your ideas. 2. 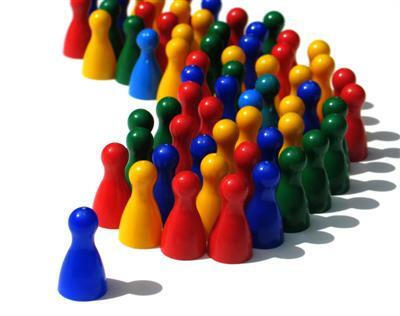 Leverage Your Natural Leadership Style – Take a leadership assessment like DiSC or Myers-Briggs to help you identify your strengths and create strategies to capitalize on them. 3. Collaboration – As a leader, you can assess the individual strengths of each team member and strike a plan that allows people to contribute in powerful ways. Increase the ‘feel-good factor’ for everyone on the team when you tap into the individual stregths of each member. Actively seek input from everyone, don’t ever assume you have all the answers. 4. Project Management – This is ‘big picture’ thinking. Manage projects or programs by accessing all of your resources, clearly communicating a vision with your team, creating well-defined project milestones, and by all means…celebrate at the end of each project! 5. Presentation – Practice speaking in the mirror and to friends. Seek opportunities to get more comfortable sharing ideas to small and large groups. You want to move people to action, so choose your words that have impact and speak in a way that shows your passion. 6. Strategic Thinking – A dream without a plan is only a dream. Create specific goals with deadlines and milestones so you know you’re making progress. 7. Innovation – Some people are naturally innovative, they see possibilities where others don’t. If you’re not particularly gifted in this area, use creativity exercises like brainstorming to tap into new ideas. 8. Negotiating – Consider what’s ‘in it for them’ before you try to get what you want. Start a conversation with what you bring to the table, not what you want. 9. Delegation – A smart leader relies on a trusted network to help when help is needed. Don’t try to do everything yourself, you simply can’t accomplish everything alone. 10. Change Management – Every industry is affected by change in this economy. Try to flex to the shifting business climate and keep your team informed of any change on the horizon, if possible. great article! difference between management and leadership – huge!!! leadership requires more EQ; foresight to see the best in our colleagues and put them in places they thrive and feel good about their contribution and success….in the process, Aon and our clients win!